Instagram is the go-to social media platform for brands right now. With more than 500 monthly active users and a higher engagement rate than its parent company Facebook, it’s no surprise that brands love Instagram. Plus, the platform continually rolls out new features, such as Instagram buying tools and IGTV. The most exciting new feature in recent months worth adding to your Instagram marketing strategy? Instagram highlights. I am loving this feature and it’s one you, too, can leverage for your business. 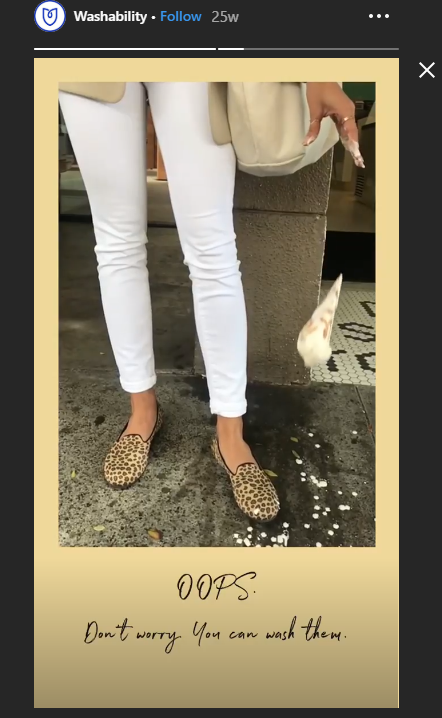 Here is everything you need to know about Instagram highlights — including where to get those cool cover images, aka icons, that your favorite brands are using. Before we talk about what Instagram highlights are, we need to talk Instagram Stories. Instagram Stories allow users to share time-sensitive photos and videos with followers. After 24 hours, those images are gone forever. Or are they? Not any more. Enter Instagram highlights! What are the benefits of using Instagram highlights? Instagram Stories are extremely popular with brands because they show up at the top of Instagram users’ news feed. According to Instagram, nearly 400 million accounts use Instagram stories every day. Instagram highlights let you extend beyond the reach of your stories by saving them on your profile forever (or as long as you want them there, anyway). Whenever anyone views your profile, your favorite Instagram stories will be highlighted, front and center. You can give well-performing stories a longer life span. You can create a curated list of important information about your brand and make it easily accessible to all your followers —including new followers who might want to learn more about who you are and what you have to offer. Easily highlight timely content, such as events, promotions, or challenges, without paying for ads or boosts. 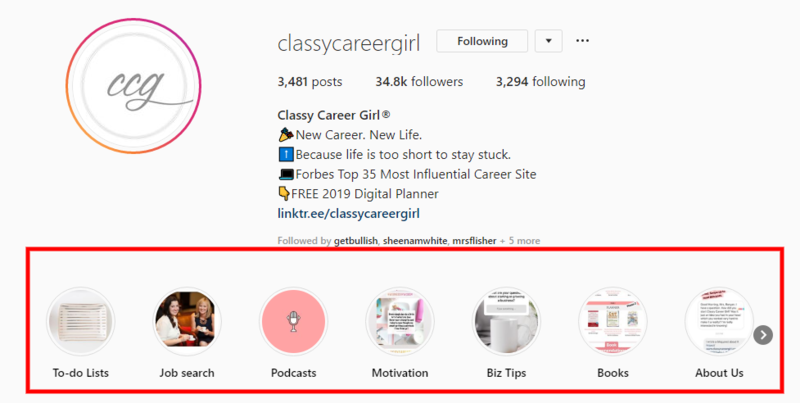 Easily connect your Instagram to other platforms your brand is on, such as podcasts or blog posts. Now that you understand all the benefits of using highlights, let’s look at how to do it. Creating story highlights is pretty simple. You can do it from both brand and personal accounts. Here is a step-by-step guide to creating your very first Instagram highlight. Go to your Instagram profile, then tap the “+” sign just under your profile photo. This is where you will add a new highlight. Now you will see every image you have published in a story, listed in descending chronological order. Tap the images you want to include in your highlights. Make sure to tap them in the order you want them to appear. Choose another image to be the cover of your highlight or upload one from your camera roll. If you are looking for awesome cover images, check out the last section of this article. Give your highlight a title. Make sure it accurately describes the information and is between 10-12 characters long, otherwise it will get cut off. Tap “Add” to create your Instagram highlight. Now, your highlight will appear just below your bio on your Instagram profile until you decide to change it. Lastly, don’t forget to add words to your stories and highlights. You can learn more about captions in How to Write Good Instagram Captions (With Lots of Examples). What I love most about Instagram highlights is there are so many different ways to use them. As an added bonus, they really expand the functionality of Instagram. The lack of links on Instagram can be refreshing, but it can also be a drawback for brands that want to drive traffic to their website. With highlights, you don’t have to worry about wasting all that time you put into creating the perfect story. Now, you can keep it forever. What Instagram highlights will you create first? Here are a few ideas of how to use highlights, along with examples to inspire you! 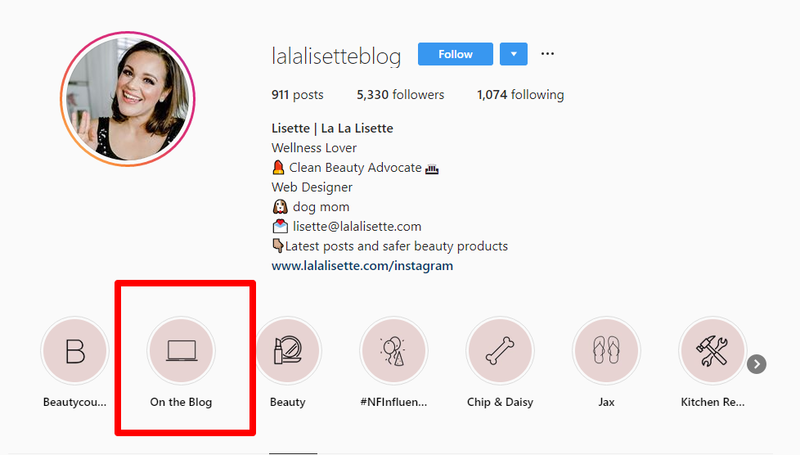 Beauty/wellness blogger and web designer Lisette of La La Lisette uses her Instagram stories to drive traffic from Instagram to her blog. Instagram has made it notoriously difficult to drive traffic to other platforms, but with stories, you can easily post a teaser of your new blog post, then use highlights to keep them all in one place right on your bio. If you love the cover images/icons she uses, check out the last section of this article. She shares free cover images on her website. Another popular way to use highlights is to categorize content so your followers can easily find the content they like. 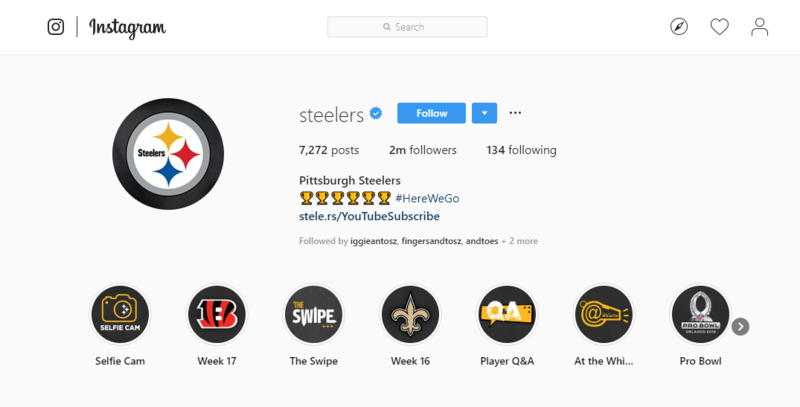 Take, for example, the Pittsburgh Steeler’s Instagram profile. They use highlights to categorize content from games, Q&As, and selfie cams. This also prevents followers from missing out on your awesome content if they don’t happen to catch your story before it expires. 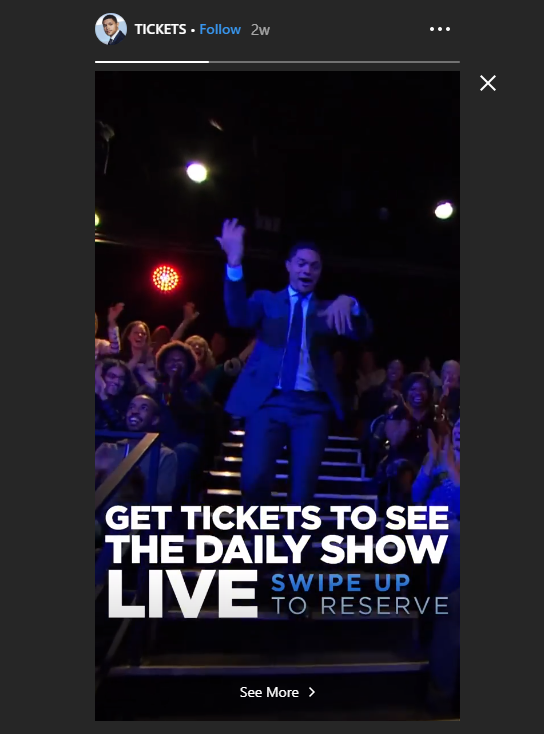 The Daily Show, a comedic news show on Comedy Central, uses its Instagram highlights to add additional functionality to its Instagram feed, including the ability to purchase tickets to shows. It is incredibly well done, and the cover photos make the highlights look like clickable buttons. The highlight is a single video frame and when you swipe up, it takes you to their page on showclix where you can select days and buy tickets. Other highlights allow you to watch full episodes, see behind the scenes footage, or purchase their book. What’s not to love about this usage of highlights? The Chicago Navy Pier is a historic pier located near downtown Chicago. The Pier hosts events throughout the year and is home to a museum, several restaurants, and an iconic Ferris wheel. They use their highlights to showcase events as well as other attractions at the pier. 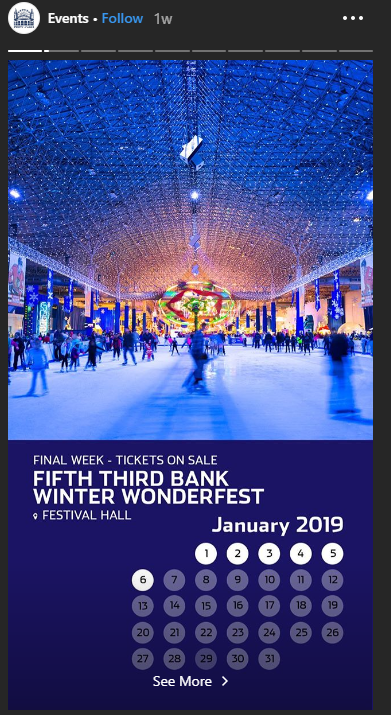 This highlight is a collection of nine different photos highlighting all the events at Navy Pier in the next month. The icon calendar makes it very easy to see exactly when specific events are happening. For the holidays, airline company Delta ran an initiative called the Kindness Wall. The goal was to celebrate kindness and connect people. Passengers were encouraged to leave an anonymous note for someone else. Then, Delta highlighted the initiative on their Instagram feed. Pro tip: Note how the name displays: “Kindness W..”. Keep in mind any characters over 10-12 in your highlight title could get cut off. The story highlight is 11 frames long, and shows what the Kindness Wall is as well as several people writing or receiving a note. 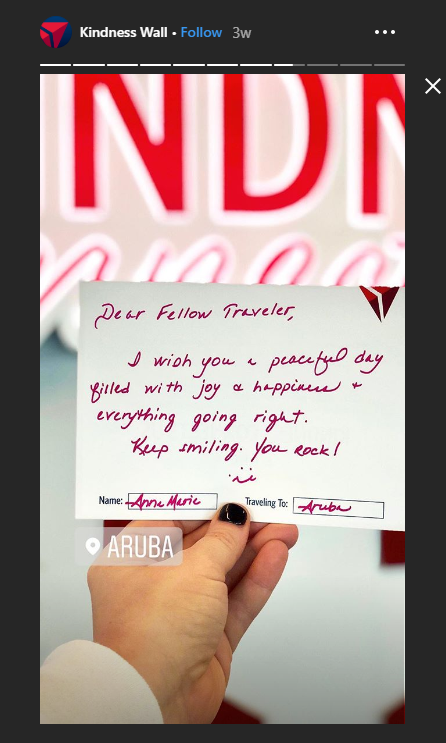 It is a feel-good initiative, and including it as part of Delta’s Instagram highlights gives the initiative a bit more mileage. 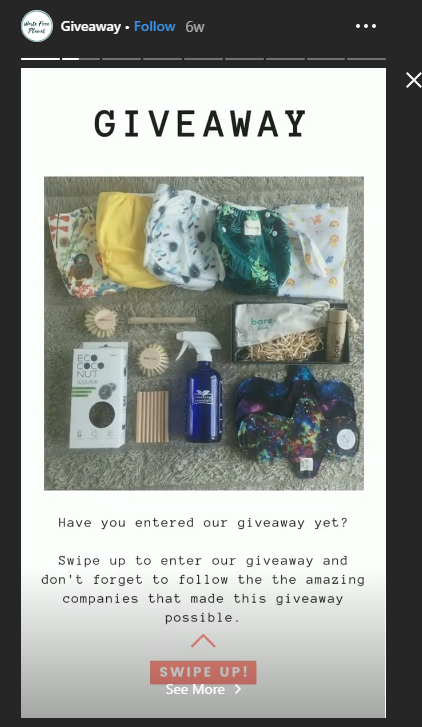 Another fantastic use for Instagram highlights is to showcase a giveaway or a contest. Waste Free Planet does this in its highlights section. 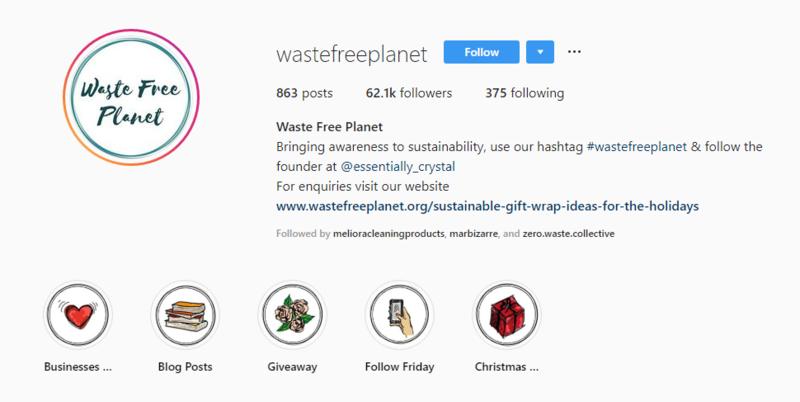 Waste Free Planet is a website and community dedicated to raising awareness about sustainable practices. 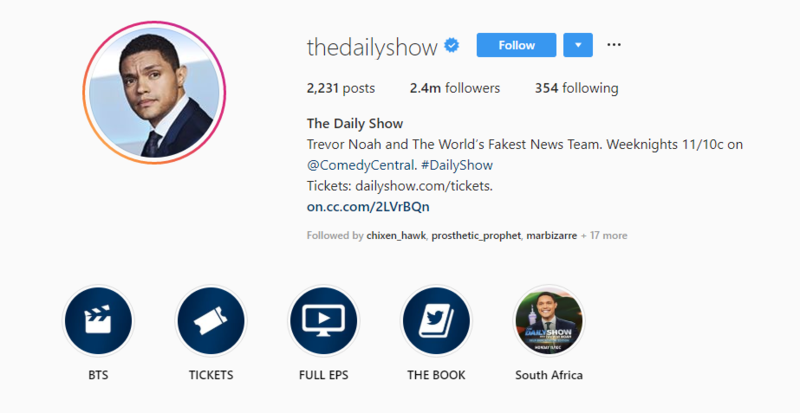 I also really like how the cover images look like little sketches, which is more in line with the organisation’s brand than, say, the icons the Daily Show uses. The “Giveaway” highlight shows off all the brands that contributed items to the giveaway and tells you how to enter. This is much more effective than just posting an Instagram story, which would be gone in 24 hours. After the giveaway is over, the highlight can be simply deleted. 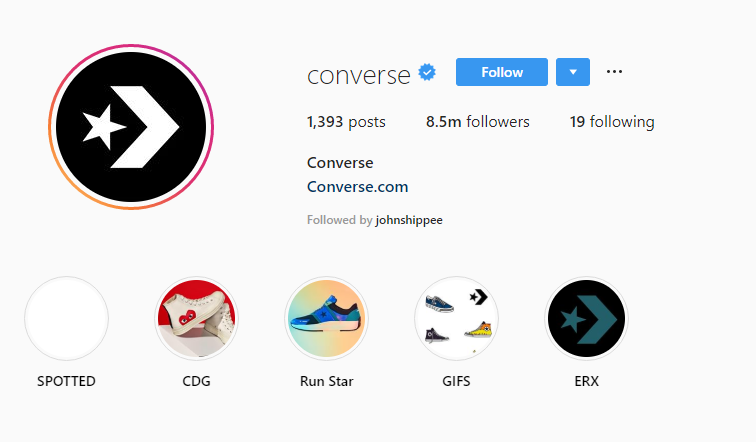 Shoe company Converse uses its Instagram highlights to showcase different product lines, including its Run Star and kids’ shoe line CDG. Most people are familiar with the classic Converse line of tennis shoes, but by using this space to show off lesser-known lines they can expose followers to all their products. Shoemaker Rothys is known for creating sustainable, comfortable footwear out of recycled plastic. One of its most popular features is that they are washable. (If you wear flats without socks, you understand how awesome of a feature this is!) They use their highlights to mention this unique feature. This highlight could have been improved by offering more details, like subsequent videos on how to wash and dry their shoes. Still, it is a terrific usage of Instagram highlights. 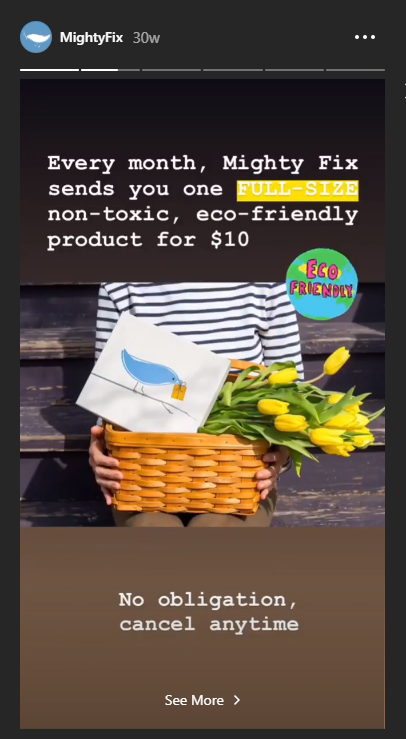 Eco-friendly online retailer Mighty Nest uses its highlights to preview one of its most popular products — a monthly subscription box of eco-friendly items called Mighty Fix. For just $10 a month, the company ships subscribers one item valued at more than $20 to help them reduce their waste. If you are looking for a free, effective way to increase sales, your Instagram highlight is just the place to show off your new product. This would also work well for book or course launches. As you’ve noticed in the examples above, Instagram highlight covers can really take your Instagram highlights to the next level. They can be used to showcase your best content, highlight a topic, or even look like buttons. 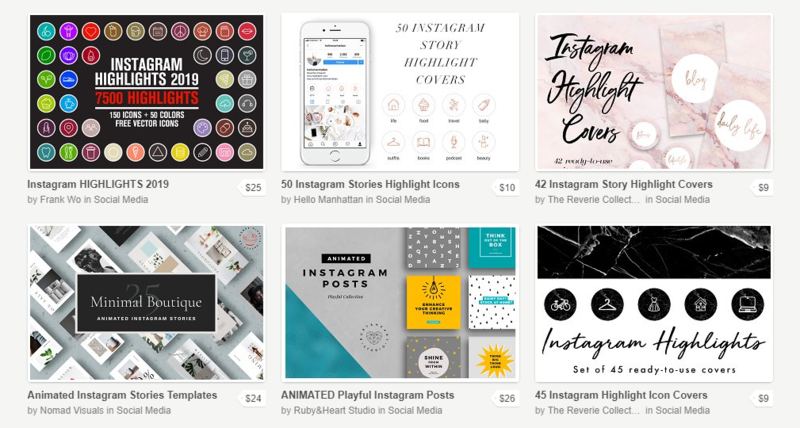 Creative Market is an online marketplace for all things creative, including social media templates, photos, fonts, business cards, and much more. Check out their Instagram highlights packages and find one that fits your brand’s aesthetic. Prices start range between $9 and $30, depending on what comes in the packages. Most icon-only packages are >$10. Pinterest is a fantastic resource for finding cover images or icons. Here are a few of my favorites from Pinterest. Emily Marie’s Tips and Tricks: Includes a tutorial on how to make your own as well as a collection of free cover images you can use yourself. Didn’t find just what you need at any of the above places? You can also create your own using an online designer like Canva or Snappa. Both offer a variety of icons and templates you can use to design the perfect cover image for your highlights! Instagram highlights are a fantastic addition to Instagram, especially for brands. There are so many different ways to use this feature, and it really extends your ability to share content with your Instagram followers. Have you used Instagram highlights yet? What do you think? Share your thoughts in the comments below! The post How to Use Instagram Highlights (and Where to Download Cover Images) appeared first on Revive Social.